Throughout our projects, from design to handover, safety is a central concern at Soletanche Freyssinet. 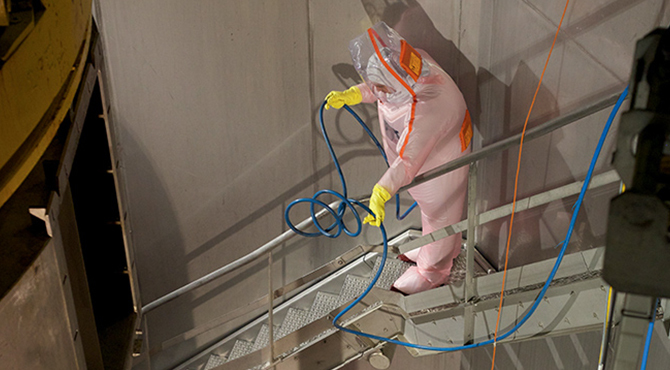 Safety is an integral part of our organisation, equipment, processes and techniques at all levels of our companies. Our collective and individual commitment to safety is based on our shared health and safety rules, which define our exacting standards and enable us to make progress towards the goal of excellence shared by all our brands. 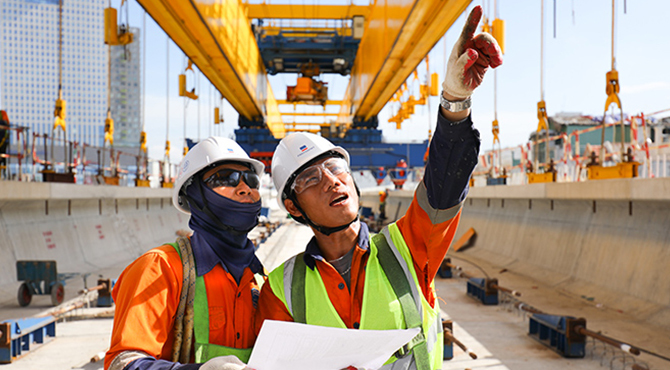 Our safety culture takes inspiration from our projects' and worksites' best practices in the field. Everyone in our companies helps to build it, with the active engagement of every employee and strong manager involvement. Working safely requires flawless preparation, from project design to the Prestart Meeting carried out every morning on our worksites. Everyone involved - in design, methods engineering, planning, works, health and safety - works together to help achieve this objective. During International Safety Week in 2017, the Chairman of Soletanche Freyssinet renewed our commitment: we are the worksite! To provide our worksite employees with hands-on training in preventing falls from height, we opened our first centres equipped with scaffolding and using role-playing training modules in Latin America and Asia in 2016. Their purpose is to offer training specific to our business activities (crane and drill maintenance, silo installation, reinforcement cage loading, etc.). By the end of October 2017, 10 centres had been set up and the programme is now being introduced across the board. In April 2017, nearly 600 employees of Soletanche Bachy's Mexican subsidiary got together to discuss the year's QHSE theme, "Safety is in your hands". To build a common culture of paying attention to oneself and others requires the involvement of everyone on the worksite, including families and friends. During the meeting, the children of our employees made a deep impression with an emotionally gripping video called "Cuidado en las manos". 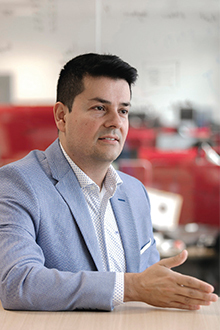 Daniel Sanchez: Following several years of a safety culture based on procedures and rules, we are now emphasising individual responsibility… for the benefit of everyone. Mentalities are changing. Working safely means watching out for oneself and others. We have made progress. Cimesa, Soletanche Bachy's Mexican entity, is a case in point. Every year since 2012, the lost time workplace accident frequency rate in the Latin America region has declined by about 20%. How are you going to keep up the momentum that has been built? Manuel Peltier, Chairman and Chief Executive, Soletanche Freyssinet: To continue our progress toward our Zero Accidents goal, we are working to strengthen managerial responsibility and will be concentrating on major, recurring accidents. Action is being taken on two issues. To provide training for our worksite personnel in preventing falls from height, we opened our first training centres equipped with scaffolding and simulation modules in Latin America and Asia. The programme is gradually introduced across the board. In 2017, we are focusing on the risk of accidents involving the hands, and on introducing "Safety is in your hands" action plans and practical measures designed to drastically reduce this type of accident. We will continue to invest heavily in training to boost our safety culture. Daniel Sanchez: That is one of our major projects – making safety second nature. In Chile, we have set up a risk perception test that takes just a few minutes to assess the risk awareness of the people we recruit. 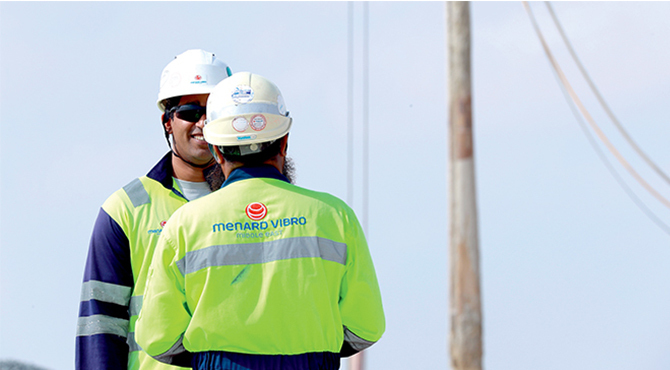 The Latin American subsidiary teams continued to systematically roll out Prestart Meetings and carried out a large number of safety inspections and debriefings. In addition, they encouraged people to engage in creative team building activities and enjoyable, interactive training programmes to share the common culture based on making a commitment to oneself and others. The culture covers everyone on the site and their families. But besides focusing on individual behaviour, I think we will also win the safety "battle" by working on transparency. Manuel Peltier: Yes, it is crucial that top management set an example and that supervisory staff make a commitment at all levels. All our subsidiaries are working to raise risk awareness and ensure that safety becomes an integral performance lever everywhere. Daniel Sanchez: Safety is our priority but it must not cause us to forget about health and our social and environmental commitments. In this regard, Soletanche Bachy Cimas, in Colombia, set up a broad-based social partnership campaign in 2016 called "Together". It is divided into three programmes. "Going to School Together" reduces illiteracy in our teams and boosts the autonomy of employees who left school very early. 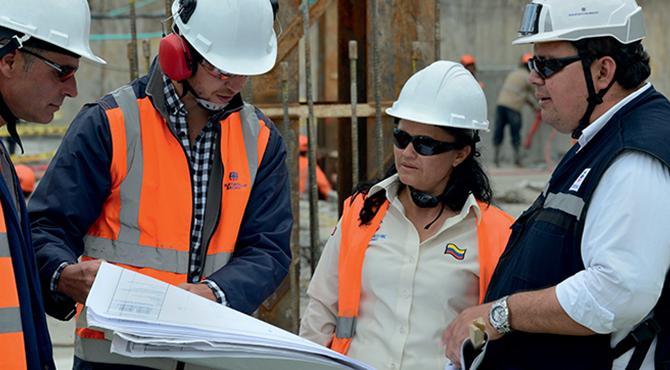 "Building Together" helps us repair or build childhood centres, particularly in Bogota. And "Succeeding Together", a corporate volunteer programme, enables us to help employees living in difficult conditions to improve their housing. Manuel Peltier: Cimas won a prize for this campaign (editor's note: awarded by the Corporación Fenalco Solidario Colombia). This illustrates the fact that we are an efficient, mutually supportive international group. Our social and environmental responsibility ties in closely with our ethical commitment. We continued to set up a compliance programme in line with international regulations governing corruption and transparency.